HTML marks up the structure of all content in a website. All texts, images, and videos on a website are surrounded by HTML tags. For example, a paragraph on a webpage is surrounded by the “<p>” tag. A hyperlinked image or text is surrounded by the “<a>” tag. Besides adding basic structure to the content, you can also add “class” and “id” to HTML tags so that you can easily style the content with CSS. 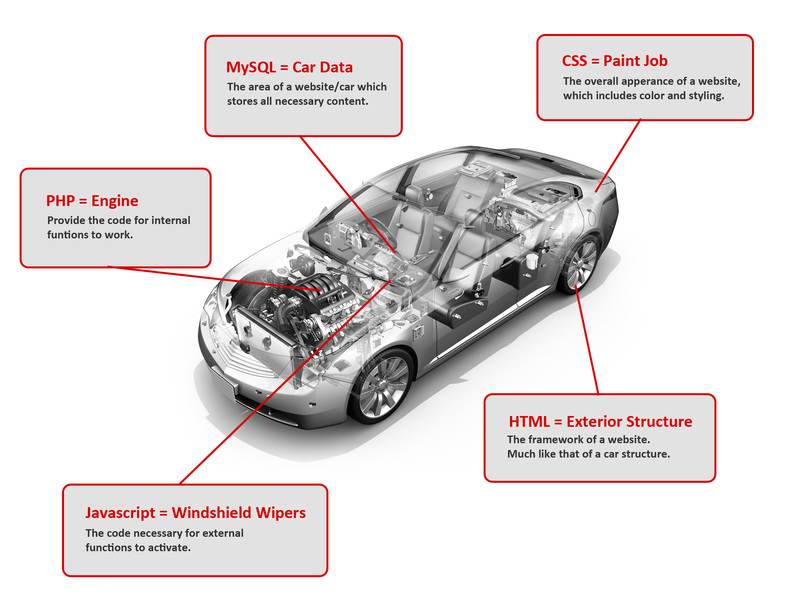 Think of HTML as the exterior structure of your car. CSS tells a web browser how to display the HTML elements. It is the skin layer of a website. For example, you can specify all text surrounded by the “<p>” tags (All Paragraphs) to be in “color: blue”, “font-size: 30px”, and “margin-bottom: 50px”. You can also target a specific paragraph with a specific “class” or “id” if you want to have different styles for different paragraphs. Two websites with the exact same content and functions can look completely different with various CSS. Think of CSS as the color and styling of your car. As its name suggests, PHP preprocesses the content before it gets displayed as HTML. It adds functions and logic to a website. For example, you can use PHP to automatically get today’s date and surround that date with HTML tags (versus manually updating the date everyday). You can use PHP on a specific image to show up only on certain dates (versus manually putting/taking out the image on those dates). You can also use PHP to send emails! PHP makes a website dynamic versus a static HTML website. Think of PHP as the engine of your car. MySQL is the most popular Open Source SQL (Structured Query Language) database management system. It is used to store all content (username, password, blog posts, products information, etc…) of a website. WordPress and Magento use PHP to communicate with MySQL database to store/retrieve/delete content. This allows the use of PHP templates that can dynamically update the content of a website whenever you make a change in the backend instead of going into the HTML code of a specific area and manually updating the content. Think of MySQL as the information stored in your car system.